Successfully Added ONAGOfly 1 Plus Drone - GPS Navigation, Auto-Follow, App Control, 15MP Sony Camera, 1080p Video, 360-Degree Pictures (Black) to your Shopping Cart. Take off to the skies and snap mesmerizing 15MP pictures and 1080p video with the ONAGOfly 1 Plus drone. This video drone allows you to fly through the skies and experience your surroundings from a perspective like never seen before. 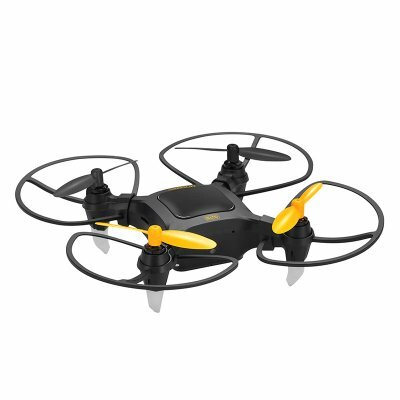 With a flying range of 50 meters and capability of reaching high flight speeds, this mini drone is able to reach any place in your proximity in no time. Thanks to its ultra-light weight and compact design, this mini drone can be efficiently carried along in your backpack or suitcase, allowing you to bring it along on your upcoming trips and adventures no matter where life will take you. Thanks to its miniature size this video drone can be easily controlled and maneuvered around even in tight spaces, allowing you not only to fly around outside in open fields but also in busy cities, abandoned factories, or even your own living room. Thanks to its easy controls, the ONAGOfly 1 Plus drone is the perfect cool electronic gadget for beginning pilots and advanced drone enthusiasts alike. No matter your flying skills, with this Quad-Copter you’ll be assured to enjoy countless hours of flying and photography fun along with all your drone flying buddies. Equipped with powerful BLDC motors, this GPS drone packs some serious power that allows you to reach high speeds and fly long distances. Supporting numerous of control navigation options, this quadcopter packs a ton of different features that bring along hour worth of fun for beginning and advanced drone pilots alike. Thanks to its GPS auto-follow feature, for example, this mini-drone can be programmed to follow one specific person or to circle around a particular object, allowing you to record its every move with its beautiful 15MP Sony camera. Added to that, this Quad-Copter supports 360-Degree photography and video, allowing you to snap absolutely breathtaking images and footage at any occasion. Easily sync the ONAGOfly 1 Plus quadcopter to your smartphone by downloading the freely available mobile application from the App store. From now on you’ll be able to instantly receive the pictures your drone takes from above on your mobile device and, additionally, watch the live footage that your mini camera drone is shooting from above. Packing a sophisticated and lightweight 900mAh battery, this mini quadcopter allows you to conquer the skies and enjoy all its amazing features for up to 10 minutes continuously, bringing along unlimited fun for you and all your friends. The ONAGOfly 1 Plus drone comes with a 12 months warranty, brought to you by the leader in GPS drones as well as wholesale electronic gadgets..
Arabic: - الفيديو بدون طيار - Chinese Simplified: - 视频无人机 - Czech: - Video DRONY - Dutch: - Video Drone - French: - Drone vidéo - German: - Video Drohne - Hebrew: - זמזום וידאו - Hindi: - वीडियो गबन - Hungarian: - Videóinak Drone - Italian: - Drone dei video - Japanese: - ビデオ無人探査機 - Korean: - 비디오 항공기 - Malay: - Video berdengung - Norwegian Bokmål: - Video Drone - Romanian: - Pagina Drone - Russian: - Видео Дрон - Spanish: - Video zángano - Thai: - วิดีโอเสียงพึมพำ - Turkish: - Video dron - Vietnamese: - Video Drone.